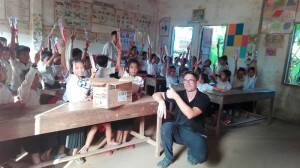 In the Jungle outside Kampong Cham there is a little school called Pong Ror. During 2015 money from Festival Republic was used to build a sink here and since then the students has been part of the Bike 4 Cambodia dental care project. Our Dental hygienist Mr Ramil visits the school a few times a year and our Swedish volunteers has also been here to do check ups, hand out toothbrushes and teach how to brush their teeth. Mr Phally is in charge of the project at Pong Ror school.